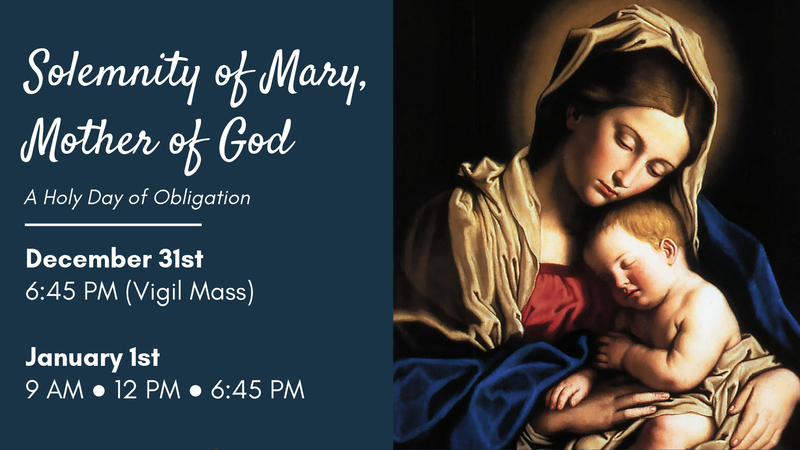 Join us for mass to celebrate the Blessed Virgin Mother. The title “Mother of God” goes back to the third or fourth century, but the Greek term Theotokos (“The God-bearer”) was officially consecrated as Catholic doctrine at the Council of Ephesus in 431, thus becoming the first Marian dogma. At the end of the Council of Ephesus, crowds of people marched through the streets shouting: “Praised be the Theotokos!” This Catholic doctrine is based on the doctrine of Incarnation, as expressed by St. Paul: “God sent his Son, born of a woman, born under the law” (Galatians 4:4). In its chapter on Mary’s role in the Church, Vatican II’s Dogmatic Constitution “Lumen Gentium” (“Light of the People”) calls Mary “Mother of God” 12 times.